What really happened during Jesus’ final days? It was, historically speaking, nothing much; a death in Jerusalem, a routine execution at the edge of an empire. Yet that execution – and the events surrounding it – were to have a profound effect on the history of the world. 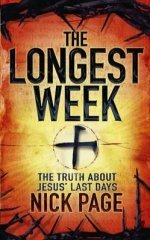 The last week of Jesus’ life on earth was probably the most important week in history. This book aims to reconstruct the events of those days.From Jesus’ entry to Jerusalem on the Sunday, to his resurrection a week later; this book explores the claims and explode the myths. It looks seriously at the evidence of the gospel accounts, without ducking the controversies and contradictions. It focuses on the history rather than the spiritual and theological significance of events and uses archaeological research and detailed Biblical analysis to take the reader through THE LONGEST WEEK. 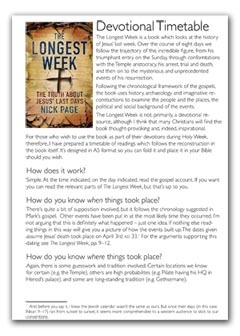 This is a day by day guide to Holy Week, with the relevant passages from the gospels, and a suggested timetable for reading them. The idea is that you can follow the events of the Longest Week by ‘reading along’ day by day. So, if an event happened early in the morning, that’s when you do the reading. It’s designed to be folded to A5 so it’s handier for storing in Bibles, etc. This was an event I did some years back, first in my home village and then elsewhere. The idea was simple: I superimposed a map of first century Jerusalem over the village. Then, each day we would recreate the events of the week‚ meeting together to read the gospel accounts at the time when they occurred, and in the Eynsham equivalent of where they occurred. You can find out more about it here as well as a number of resources and a timetable to help you adapt it to your own situation.